Picnic thieving ants have taken over my room! 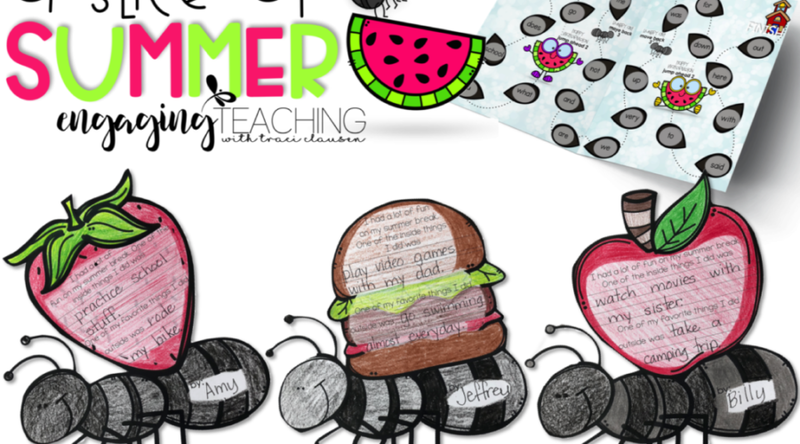 I am excited to share this fun back to school activity with you. This school year has started off lovely. I have some amazing kiddos in my class. They’ve really been impressing me. One of the shocking things that has been occurring over these last few weeks is that my “quiet” cues (hand signs, chimes, train whistle, claps, attention-getters and the rest of the arsenal used the last couple of years to with less than desirable results) actually work. The.first.time!! It’s a nice change! Most are very neat and careful workers, too. And many have shown some creative, independent thinking that is inspiring and fun – not annoying and rule-breaking. This resource has been updated since this article was originally posted. The blacklines have been changed so that they are more simple for the kiddos to cut out. See the following photos. I’m so impressed with the effort and care. Look at that first picture. Gorgeous printing. Gorgeous coloring. Even the nail polish, gorgeous! In the second picture that little guy has colored his ant red. The samples had black ants. To be honest, I didn’t even give red ants a single thought. But he did. He didn’t even ask if he could color his ant red, he just did it. With confidence! Moreover, there were no purple, green or pink ants. Everyone actually colored – with a variety of color! Not a scribbler in the bunch. Who knew you could be so happy making picnic thieving ants?!? Earlier in the day, I gave them this Label It! page to complete during their independent work time while I worked with small groups. Additionally, during word work the kids played with our Slice of Summer sight word game. I use the one with the words already printed on it, but this resource includes a blank game board. Teachers can write in any words they would like the kids to practice. I LOVE these board games. The kids can’t get enough of them. They are constantly engaged in practicing their sight words. It’s easy for them to play and moves pretty quickly so lots of kids get a chance for a turn. Since it is the beginning of the year, our bulletin boards are empty. They couldn’t wait to get their ants on our big slice of watermelon. We started our lesson brainstorming our summer activities – both indoor and outdoor. Thank goodness 6-year olds think my drawings are simply amazing. We talked about “recall” and “reflection” and how it helps us learn new things when we use what we already know. With these littles, beginning of the year activities are most engaging when they involve things with which they are completely comfortable and can relate to. So, talking about their indoor and outdoor summer activities had them all participating. Then they went to work on their ants. I let them choose the ant they wanted to work on. However, I copied an amount of each that would ensure that their would be a good mix of all three types. A Slice Of Summer is a great introductory activity. The kids really enjoyed it. Starting out slow and easy with writing helps the kiddos get used to doing it all the time. This works perfectly as one of our first “projects”. They aren’t overwhelmed and no one whines! Win-Win! You can grab A Slice of Summer in my store. Speaking of bugs – I don’t know WHAT is going on around my house. All of a sudden there are rolly-pollies EVERYWHERE! As soon as we sweep them up, another 20 show up! It is absolutely crazy. They are inside and outside. Just all over the place. We’ve been invaded and although I’ve never been bothered out by rolly-pollies or pill bugs, or Armadillidium (I looked it up) – they are really starting to creep me out! Where are they coming from?! Some of you have mentioned you have cockroach issues at your schools which I could not handle for even a second – so, yes, I know I should not even mention being bothered by ants and rolly-pollies. I’m sure they both serve some kind of useful purpose that I should appreciate. So, I leave you with some questions… please leave me some answers…. Are you fighting off rolly-pollies? Are you all back to school now? Have a great rest of your week peeps! I love the. Way you shared the a to its from your pack! It was great to see this activity working and it looks fantastic. I just put that pack in my shopping cart! I kinda love those ants and I have a hallway that is calling for them! Seriously might be one of the CUTEST boards ever!!! Simply adorable girl! Traci- We are so lucky!! I feel the exact same way about my class this year….in love <3. Your watermelon board is precious and I love the ants. Too cute my friend.